There is a new game in town at Silver Legacy Resort Casino in Reno, Nevada. 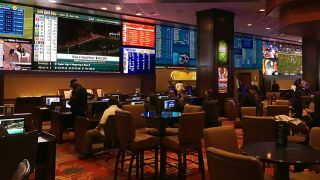 A $2 million renovation to its William Hill Race and Sports Book included the addition of two large-scale LED video walls managed by a RGB Spectrum MediaWall V display processor. Walking into the new sports book, Silver Legacy guests will be captivated by the two 27’ x 9’ high-definition LED walls. The wide-open space offers 167 seats of unobstructed viewing. The two video walls provide seamless high-definition images on a bank of video displays spanning the width of the 7,200-square-foot sports book. The MediaWall V processor provides the advanced video wall flexibility and scaling required to optimize images for the unconventional 3:1 configuration of the LED displays. The MediaWall V delivers several DirecTV sources and advertising content to the two video walls which are made up of Absen N4 LED panels. The processor’s intuitive user interface enables presentation of content into a range of layouts. Silver Legacy audiovisual personnel quickly learned how to configure their display sources within one day of on-site training by a RGB product specialist. Since then, Audio Visual Director Phillip Karam’s team has found it easy to maintain and configure the video walls themselves. After the video wall layouts are decided upon, they are saved as presets in a Crestron AV control processor. Basic switching of sources and layouts is handled by operators at the bar or betting counter. The MediaWall V provides perfect pixel allocation and reliability for Silver Legacy, which places high value on image quality and engagement of its guests. The new William Hill Sports Book is becoming increasingly important to the casino and its parent company Eldorado Resorts, which places good odds on the excitement brought by having video displays throughout the space. Visit www.rgb.com and www.silverlegacyreno.com for more info.